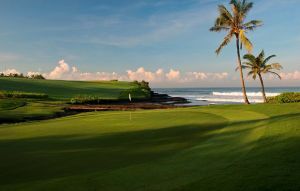 Stunningly set on the southern tip of the island just 15 minutes from the airport, this Hawaiian-themed championship course will likely once again host the top pros on the Asian circuit. The course is split into three distinct sections. The opening nine meanders uphill though tropical jungle that offers repeated glimpses of the Indian Ocean and, if your luck is in and the weather is fine, the spectacular Mt. Agung in the far distance. 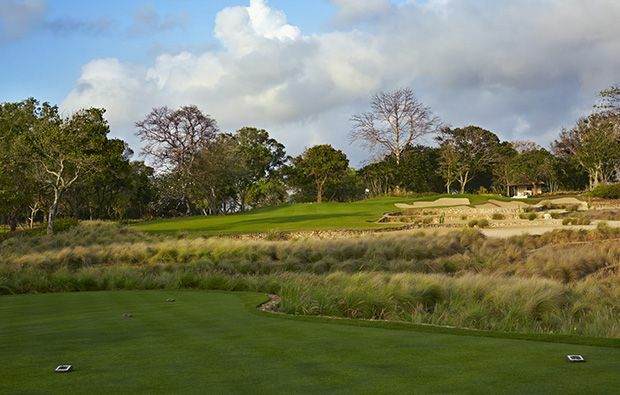 The opening dogleg left is the first of two demanding par-5s on the front nine, and you should take the opportunity to get your driver working because you are certainly going to need a big, straight hit to stand a chance of making par on the epic and narrow 618 yard par-5 7th. You may want to think long and hard before letting bravado get the better of you and deciding to take on this course from the back tees! 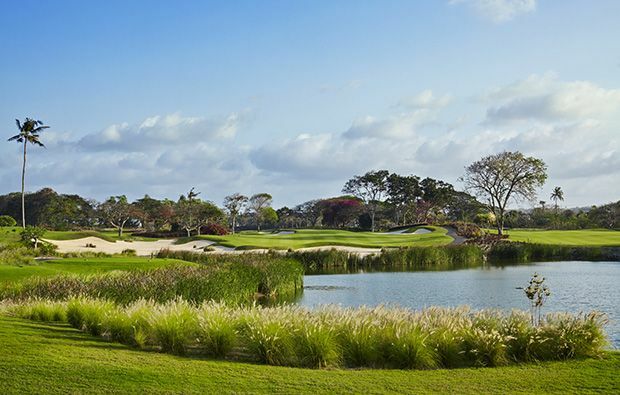 After successfully negotiating the tricky approach over water to the semi-island green of the 9th, it’s a short buggy ride to the back nine, where the jungle gives way to a coconut grove lined with palm trees up to 100 feet high. All of a sudden there are massive sand-traps everywhere – on both sides of the 10th and 11th, and all the way up the left hand side of the 13th. If you don’t enjoy having to hit mid-irons out of sand, you’ll need to be hitting straight. It’s only the bunker-free par-3 12th that offers an escape from the sand, in favour of water from tee to green. 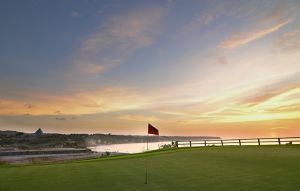 The final section is down by the beach, comprising the last two par-4s that play around an imposing 16 acre lake in front of the modern clubhouse. The cooling ocean breeze is one part blessing and two parts curse as for the first time you must deal with water hazards and sand traps at the same time. 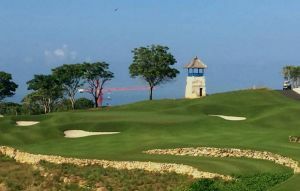 If that weren’t enough, the final approach on the picturesque final dogleg left has the added pressure of an audience, given the green is set right by the only clubhouse in Bali that offers views of the course. After a shower and a massage in the spacious locker rooms, it’s your turn to grab a drink or a top-notch meal on the terrace and enjoy the travails of those still out on the course. Superb maintenance of the newly-laid Paspalum turf ensures that the course stays in pristine championship condition all year round, and it’s wise to take advantage of the grass driving range and chipping/putting greens given the need for accuracy as your drive off through the trees. Golf carts are compulsory here but give the distance between the three sections of the course, you’d want one anyway. 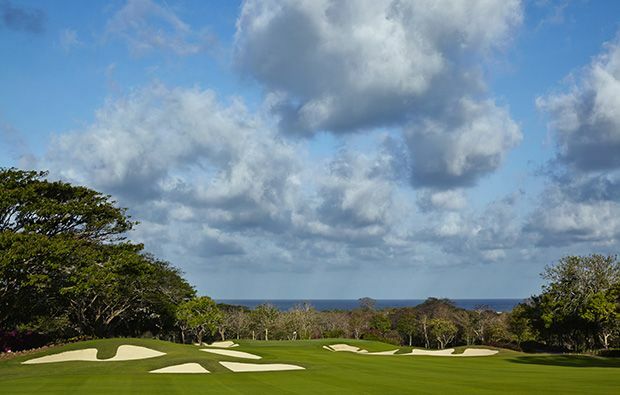 Overall, a must-play on your Bali golf holiday. 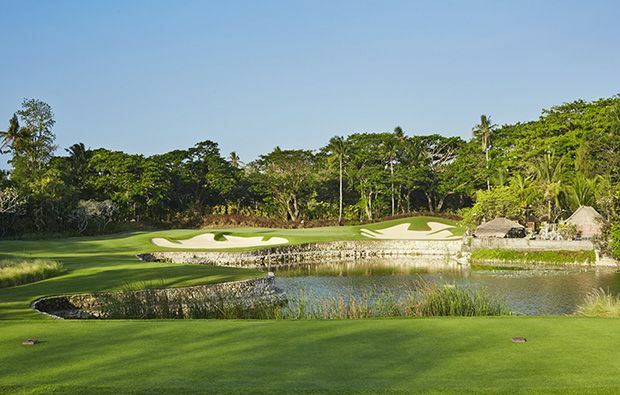 You know you are in safe hands when you book a tee time at Bali National Club Nusa Dua using the golfsavers booking engine which displays detailed information on all of the costs involved. 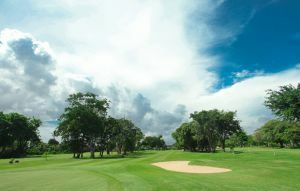 Bali National Golf Club has different Services to offer. Choose a date and number or players to see the rates.